I think that Berryz Kobo holds the 3rd place position in Hello! Project. However, the only ones to wear fish outfits are Berryz Kobo alone! Even when we're messing around, we're doing it full power, so every day is enjoyable! Tsugunaga Momoko: Her skilfulness at talking is off the charts, and I think she really watches the members! She's unexpectedly serious (laughs). Tokunaga Chinami: We do silly things when we're together (laughs). I think that it's because both of us have completely opposite personalities that there's harmony. My source of energy! Natsuyaki Miyabi: She clearly states her own opinion, and together with Captain, she brings the group together. Miya's stylish, so I think she's the type who all sorts of girls can admire, a group which includes my younger sister! Kumai Yurina: In my private time, I hang out the most with her, and we've bought matching outfits and goods. I get air-headed when I'm with Kumai-chan (laughs). 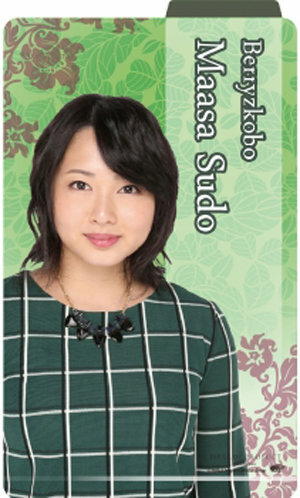 Sugaya Risako: She's taught me the most about singing. Even for songs I'm bad with, Risako would teach me aout things like the musical intervals, which was a relief! Berryz Kobo, ranked 2.8th. I'm happy that we were able to challenge ourselves from cool to funny!